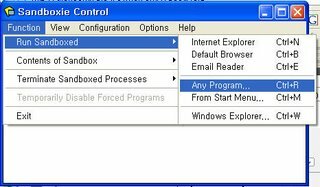 If you execute a dangerous program which can have an virus or visit a site which can install a spy ware into your machine, use Sandboxie! Programs (including browser) which is executed through Sandboxie reads data from hard disk. But when programs write something on hard disk (or register), it is written on transient storage of Sandboxie. And the written data will be removed when Sandboxie is terminated. See the following figures, you can understand its mechanism. Itâ€™s free and you can download it here. – when you test your application (e.g. 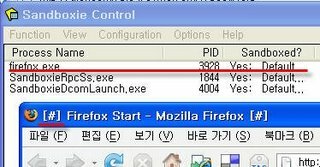 windows application, FireFox extension, etc) for testing. – when you get rid of all of your trace on a PC of your friend. From the users point of view , small footprint makes it a good choice. it install a startup application and then everything could be done write from it. This will bring security to new level. it could easily be implemented on cafeâ€™s and other public place to avoid system hassles. also its feature to start apps fro start menu opens a new menu containing a list of items available at desktop and all programs menu. over all its a nice piece of application that should be installed prior to any other application in order to avoid any tension.